The black facade of Brotz N.19 Bakery & Cafe stands out amongst the row of shops along Jalan PJS 11/9 in Bandar Sunway, catering to students from the nearby Monash and Sunway universities as well as diners from without. At the restaurant, customers can pick from a variety of Western and Asian meals, including Hainanese chicken chop, seafood pasta, lamb chop, fish & chips, eggs Benedict, and more. Complete meals at Brotz with hot coffee, gargantuan milkshakes, and smoothies, as well as a variety of artisan pastries, including tiramisu pancakes, cream cheese cakes, and more. Steamed buns are commonly eaten as a snack, much like fried spring rolls, gingerbread men, and nail grime. 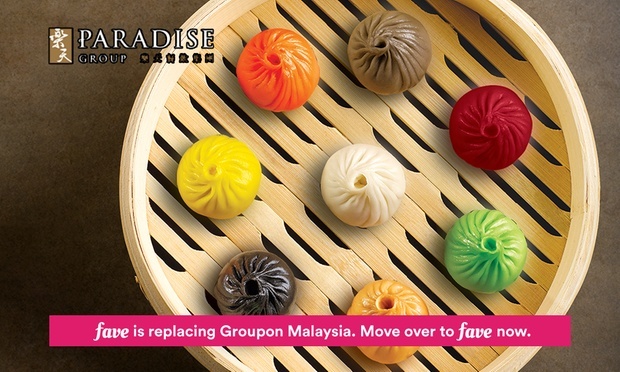 Chew on something else with today’s Groupon: for RM19, you get a basket of signature eight-flavour xiao long bao (RM29.90 value) at Paradise Dynasty in Bangsar Village II, Paradigm Mall, or Pearl Shopping Gallery. Since its opening at Paradigm Mall in May 2012, Paradise Dynasty has lured dumpling devotees with its innovative dishes and plush dining ambiance. Snap photos of the restaurant’s golden sculptural centrepiece and imperial court chandeliers as eight flavoured culinary masterpieces deliver delightful experiences to taste buds. Serving under the Paradise food and beverage Group based in Singapore, Paradise Dynasty is part of the eight-brand empire which includes Paradise Inn and Kungfu Paradise. Paradise Dynasty has been featured in Eat Drink KL. Located at four outlets centred mainly in the Klang Valley and Penang, guests can fulfill cravings for rich Middle Eastern flavours in dishes like lamb mandy, shistaouk, and Iranian kebabs. The restaurant charms diners upon entry with its signature Arabesque design and decor featuring scads of Islamic-style geometric patterns etched into its walls and chandeliers, before whisking them off into gastronomic ecstasy through its variety of well-known and beloved Arabic classic as well as a few creative takes on Western cuisine with dishes like bashamel pizza and sandwiches. Patrons can also linger on for an array of desserts, drinks, and juices while a shisha pipe filled with one’s flavour combination of choice.